I’m sure it’s obvious to a lot of people that the cover to issue #3 is one of my favorite images from the first story arc, as I’ve used this image everywhere, from my promo postcard to my online avatar. 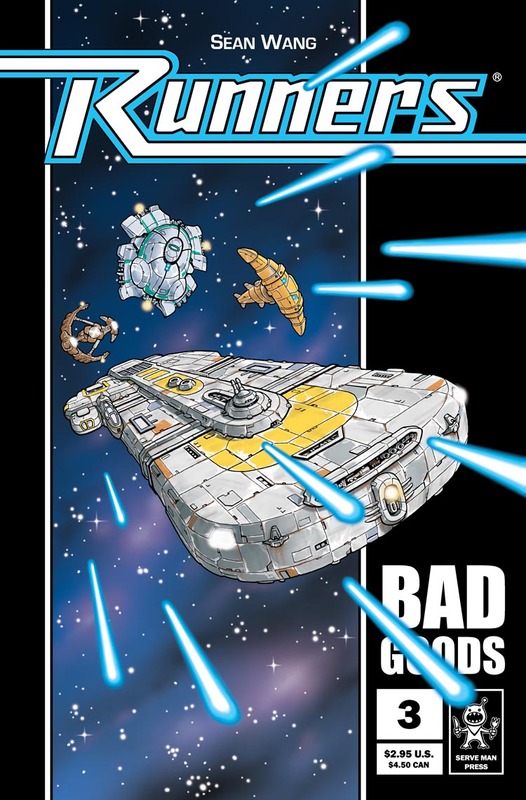 With this cover, I dropped the “Book 1” label that had appeared over “Bad Goods” on the first two covers. Since I always planned to do RUNNERS as a series of mini-series, I wanted people to be able to easily tell the chronological order of the different arcs, so I included “Book 1” on the covers so people would know this was the first story arc. But after doing a number of conventions with issues #1 and 2, I realized that people were getting confused by it, thinking “Book 1” meant that it was the first issue, rather than an issue of the first arc. So with issue #3, I decided to drop the label. “Volume” is the droid you were looking for. Exactly! I have since adopted the use of “volume” to refer to different story arcs, as evidenced on this very website. Not sure what I was thinking back then though!